North America Forum»Forum ›League of Angels ›General Discussion › what the hell? Tarot timer nerfed to sh*t? Started L6 at 25 seconds, no mistakes up to this point and this is how far I got. 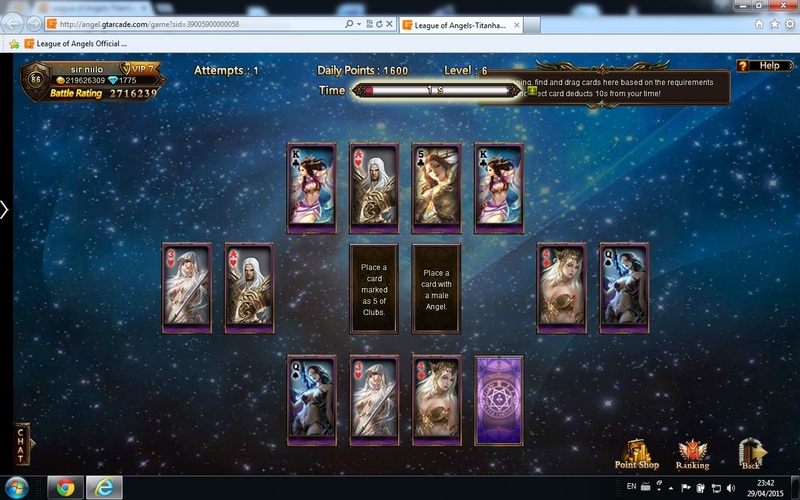 It can take 3-5 seconds to find the card to answer the questions -; this is a LOAd of crap what you did with tarot. All you people who are gonna say I\'m crap at tarot, well I ALWAYS got top ten, most often, in top5 in my server with original tarot. Tarot is ruined, congrats for the awful job devs. You aren\'t the only one having to do this so you should still be in the same placement. I never knew about the cheat though so don\'t understand how this will stop the cheating. only changing the prizes was enough. Cheaters will cheat no matter what they do the game wont be fair. I always did Tarot before the change, also was near top of rankings,;usually got into LVL 8, often 9;now cannot complete LVL 5 at all. ; It used to be a fun memory challenge, now it is a worthless, severely time linmited;casher game. ; I see other ppl getting much higher score than I do, they have to be buying time. ; GTA, are you listening? ; Do you even care about anything besides the money? Regardless, it is not fun, it is a boring chore now. ; I get though level 7 95% of the time, unless it glitches or I misread the question. ; I get through level 8 about 5% of the time since there isn\'t enough time to do the flips. ; And no, I\'ve never paid for extra time. ; I also get virtually no lag, I think. ; I can\'t see anyone getting past level 8 regularly unless they\'re exceedingly lucky or have some type of accelerator for reflipping the cards. 2019-4-27 00:24 GMT+8 , Processed in 0.069798 second(s), 50 queries .